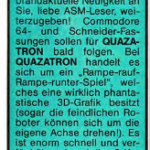 Briefly mentioned in Aktueller Software Markt (05/1986), it was stated that Quazatron (the Spectrum version of Paradroid), was to be released also on the Amstrad and CPC. Mostly as it was practically a different game! One issue later however, the magazine mentioned just a Spectrum edition. So did they get it wrong perhaps? Was anything ever started? Eventually, the sequel Magnetron did make it onto the C64 – so maybe this could have started out as a conversion of Quazatron? More details needed, but potentially just vapourware.